RustTracker.org is developed by CIMMYT and other partners as part of the Borlaug Global Rust Initiative (BGRI) to mitigate the threat of wheat rust diseases (stem rust, leaf rust and yellow rust). 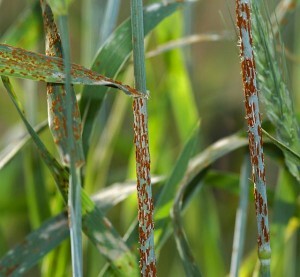 RustTracker.org is the primary web portal for global cereal rust surveillance and monitoring information. Initial development of RustTracker.org has focused on stem rust and the “Ug99 race group” in particular. Current content reflects these efforts, but in the near future expanded content for both yellow and leaf rust will be included. Development of the Global Cereal Rust Monitoring System and RustTracker has been supported by the Bill & Melinda Gates Foundation (BMGF), DFID (UK), IFAD and USAID. All supporting organizations are gratefully acknowledged. Disclaimer: Every attempt is made to present accurate information. However, the geographic designations used in RustTracker.org do not imply the expression of opinion whatsoever on the part of CIMMYT or its contributory organizations concerning the legal status of any country, territory, city, or area, or of its authorities, or concerning the delimitation of its frontiers or boundaries.